Amy Helm’s new album “This Too Shall Light” is HERE! Amy Helm returns with “This Too Shall Light,” a vibrant and powerful ode to enduring. Out now on Yep Roc Records. During the ‘This Too Shall Light’ sessions, Amy Helm was literally taken 3,000 miles out of her comfort zone – leaving the family studio in Woodstock, New York for Los Angeles’ iconic United Recording Studios, the same compound where The Beach Boys recorded ‘Pet Sounds’ and “California Dreamin” was tracked by The Mamas & The Papas. It was there that Helm began her collaboration with Joe Henry, the three-time GRAMMY-winning producer known for his work with artists like Bonnie Raitt, Elvis Costello and Lizz Wright. Together, in just four days, the pair traversed decades of material, stretching from early ‘70s Allen Toussaint through contemporary Americana darlings the Milk Carton Kids. 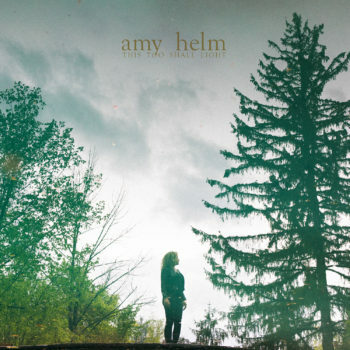 Coupled with originals by Helm and Henry, and a pair of tributes to the singer’s late father, the ten-song collection serves as the most complete look at Amy Helm as an artist to date. Order ‘This Too Shall Light’ HERE! Among the most personal songs on ‘This Too Shall Light’ are “The Stones I Throw,” a 1965 pre-The Band cut by Levon and the Hawks, and an arrangement of the traditional hymn “Gloryland,” which remained a staple of Levon Helm’s live sets through his final performances, with Amy playing a large part in his Midnight Ramble Band. Elsewhere, Helm reflects on a childhood hero, the late jazz pianist Blossom Dearie, whose live shows she found to be a transformative experience as a teenager. Stream and purchase “This Too Shall Light” HERE! Amy Helm’s new album “This Too Shall Light” available for pre-order NOW! Amy Helm signs to Yep Roc Records!